BOSTON—After receiving their degrees on Thursday, nineteen members of the Harvard Business School MBA Class of 2013 will begin working in nonprofit and public-sector organizations through the School's Leadership Fellows Program. Now in its twelfth year, the program provides Fellows with a one-year position in a nonprofit or public-sector organization where they can make a significant impact. Since 2001, the program has placed 106 Fellows with 47 organizations. Participating organizations pay Fellows $45,000, and Harvard Business School (HBS) supplements that with a one-year grant of $50,000. Throughout the year, Fellows also benefit from access to HBS resources and return to campus for organized networking and professional development events with other Fellows. Aaron Anderson, Richard Lumpkin Dean's Discretionary Leadership Fellow, City of Sacramento Mayor’s Office. Prior to business school, Anderson worked for Habitat for Humanity, International in Pretoria, South Africa, as a fundraising analyst and project designer. Megan Brown, David J. Dunn Leadership Fellow, Boston Redevelopment Authority. Last summer, Brown was an associate with East River Partners, LLC, a real estate start-up, managing new development projects. Rachel Cecil, Horace W. Goldsmith Foundation/Richard L. Menschel Leadership Fellow, Hospital for Special Surgery. Prior to attending HBS, Cecil worked for the Touch Foundation as manager of strategic partnerships, focusing on strategic planning, operations, and fundraising in Tanzania. Christopher Daniels, Horace W. Goldsmith Foundation/Richard L. Menschel Leadership Fellow, U.S. Department of Education. Before business school, Daniels was director of office operations at Teach For America. Landon Dickey, Horace W. Goldsmith Foundation/Richard L. Menschel Leadership Fellow, City of Boston, Mayor's Office. Prior to attending HBS, Dickey co-led the design and implementation of initiatives focused on teacher development and curriculum as Corps Member Advisor with Teach For America. Gena Haugen, Richard Lumpkin Leadership Fellow, Consumer Financial Protection Bureau. Before attending business school, she worked in the Strategic Planning Group at American Express. Miki Heller, Richard Lumpkin Leadership Fellow, Teach For America. Prior to business school, Heller, worked for Teach For America, teaching middle school math in San Jose, CA. During her time at HBS, she founded AppSuccess, a nonprofit that helps low-income high school student apply to college. Scott Hofmeister, Porter Leadership Fellow, Environmental Defense Fund. Last summer, Hofmeister worked on the Strategic Planning team at the Woods Hole Oceanographic Institute. Chris Hurst, Carl and Lily Pforzheimer Foundation Leadership Fellow, Mercy Corps. Prior to business school, Hurst worked for a global engineering services firm, CH2M HILL, as a project and client services manager, providing project management and technical services in Iraq and Afghanistan. Ryan Kennedy, Richard Lumpkin Dean’s Discretionary Fund Leadership Fellow, Consumer Financial Protection Bureau. Prior to HBS, Kennedy was special assistant to the CEO at Self-Help, a community development bank, focused on lending to low-income families. Casey Littlefield, Carl and Lily Pforzheimer Foundation Leadership Fellow, Social Finance. Last summer, Littlefield was an Education Pioneers Fellow at Education Growth, providing strategic guidance and financial advisory services to educational organizations. Ebele Mora, Horace W. Goldsmith Foundation/Richard L. Menschel Leadership Fellow, Year Up. Prior to attending HBS, Mora co-founded and currently leads TUVision LLC, a media company providing tools to connect other media companies with the 18-24-year-olds in the urban market. Emily Rasmussen, Horace W. Goldsmith Foundation/Richard L. Menschel Leadership Fellow, Lincoln Center for the Performing Arts. Before starting business school, Rasmussen was a professional ballet dancer with the Pacific Northwest Ballet in Seattle, and last summer, she worked on strategy and business development for the Lincoln Center. Jane Silfen, Horace W. Goldsmith Foundation/Richard L. Menschel Leadership Fellow, Trust for Governors Island. Last summer, Silfen was an associate with the Infrastructure Private Investments group at the Canada Pension Plan Investment Board, working on infrastructure private equity investing. Robert Silverman, Richard Lumpkin Dean's Discretionary Leadership Fellow, Oxfam America. Before going to business school, Silverman worked as an attorney at Business and Professional People for the Public Interest, advocating for policies to prevent foreclosures and evictions, promote affordable housing, and support community development. Dileepan Siva, Jorge Paulo Lemann Fund at Harvard Business School Leader Fellow, Endeavor Global. During business school, Siva partnered with e-commerce companies in the technology sector on strategy and business development related to international growth and expansion. Evan Sketchley, Richard Lumpkin Dean’s Discretionary Fund and Richard and Helen Bibbero Leadership Fellow, The Nature Conservancy. Last summer, Sketchley worked as a business development associate at Synthetic Genomics, Inc., where he assisted with market analysis, techno-economic and financial modeling, the assessment of new technologies, and negotiation support. Karen Tang, Margaret T. Morris Foundation Leadership Fellow, Nonprofit Finance Fund. While at HBS, Tang worked for the Liberia Philanthropy Secretariat in the Ministry of State, helping to promote the country’s small business community. Adam Zalisk, Horace W. Goldsmith Foundation/Richard L. Menschel Leadership Fellow, Harlem Children’s Zone. Prior to attending HBS, Zalisk focused most on consulting to companies, foundations, and government in the educational sector at Booz & Company. 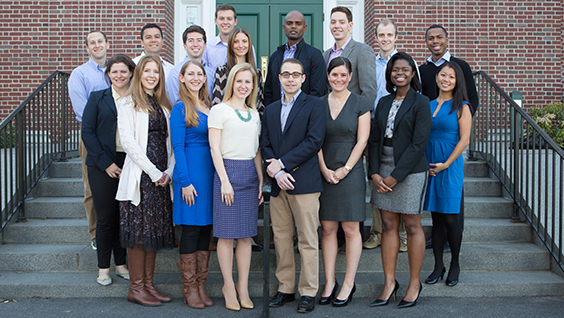 Leadership Fellows Program organizations are chosen each year by an HBS steering committee composed of faculty and staff representing the School's MBA Program and its Social Enterprise Initiative. Criteria for selection include the scope and nature of the proposed position, capacity of the organization for utilizing the leadership and management skills of Harvard MBAs, and potential student interest. Once selected, organizations are listed as available opportunities, and student interest determines the number of candidates for a particular position. Fellows are chosen by the hiring organization through a standard interview process. More than 90 percent of Fellows receive an offer to stay at the organization that initially employed them. Approximately one-third of the program's alumni are still at that organization, while one-third have moved on to a similar operation, and one-third have joined the for-profit sector. For more information, visit the HBS Leadership Fellows Program website. Since 1993, the HBS Social Enterprise Initiative (SEI) has applied innovative business practices and managerial disciplines to drive sustained, high-impact social change. The Social Enterprise Initiative acts as a catalyst for creating social value by serving as a focal point for the creativity and energy of its worldwide community. These efforts have manifested themselves in a number of areas, ranging from the participation of approximately 90 faculty members in social enterprise research and teaching to the creation of over 500 social enterprise cases and teaching notes. Courses that focus on social enterprise are embedded into the MBA curriculum and HBS Executive Education program offerings, reflecting a real-world blending of business and social issues. Beyond the classroom, the Initiative offers career development and community engagement programs designed to support students and alumni engaged in the social sector. For more information, visit: www.hbs.edu/socialenterprise/.